Learn to earn money online by creating your own product, membership site, and promote affiliate products from other companies. A membership includes access to 8 weeks of training videos, a weekly live webinar, and a private Facebook group. This online business community came as a pleasant surprise to me after reviewing a long line of scams. The training is OK is some areas but I have issues with it I will discuss below. The Facebook group is active and friendly, but $49/month is too much to charge for this product when there are better, cheaper communities out there. The one thing that is noticeably absent from Jo Barnes' sales page is hype and misleading advertising. She is very clear about what she offers inside the community, and what you can expect to learn. The sales page is actually a bit of information overload, but that's understandable when you are offering a lot of training, and trying to be up front about what buyers are actually paying for. There is a $1 trial for 21 days. A major point of confusion for me is that every time the price of $49 was mentioned, they added “for 12 months”. This indicates to me that once your trial is over and you make the first payment of $49, you are locked into a 12 month agreement. Jo later clarified that there is no 12 month requirement. This is good news, but the wording of the billing is still a bit strange. If this is not the case, why the 12 month limitation? Support has not responded to my question about this, and I just posted on Facebook to see if someone knows. Question answered! I guess a 12 month membership then lifetime free access is pretty good! 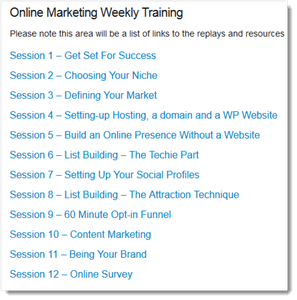 The most noticeable thing about getting introduced to the Online Marketing Academy is that Jo outlines what's going to be happening and sets some realistic expectations. She mentions that you will likely NOT be earning any money by the time the 8 week course is over, and at the end of the series, emphasis that this is just the beginning of your marketing journey. The video training was very clear, and Jo knows her stuff. She's active on her blog, and even posts to the Facebook group. Actually being an online marketer and doing the things she teaches is important in my opinion. When you are just a product owner sitting behind a wall of outsourced moderators, support staff, and autoresponders, it makes it hard to relate personally. The live weekly training is another huge thing that has to be mentioned. Some guys charge hundreds of dollars for 1 hour webinars, so getting 4/month makes this membership valuable. I didn't watch all the live training sessions, but from what I saw, they were good. The topics followed the training courses week by week, but started to veer off into a wider variety of topics as they passed week 8. I would be interested to see how these webinars progress. One more major thing worth talking about is the active community. So many places claim to have “community support” or a “private group” (sites like SBI or Digital Millionaire Bootcamp) but more often than not, these groups are ghost towns. A support group without members and active leaders is useless. But there were several posts from community members, asking and answering questions. I even saw one guy's membership site that looked really cool. It was a great idea, and not your typical “learn how to make money” niche site. It was about chickens! Now, I understand the concept of market research, and when you find a hungry market, you've got to push your way in and make money where there's money to be made. But I am sure that advice like this borders on copyright infringement. Another thing that rubbed me the wrong way was her advice to “piggy back” off of product launches. This is also called “launch jacking”, and it's the core business model for some people. They basically find products that are getting released, write reviews BEFORE they're released, then collect sales from people looking for reviews when the product is launched. You want to piggy back and launch jack? Fine. 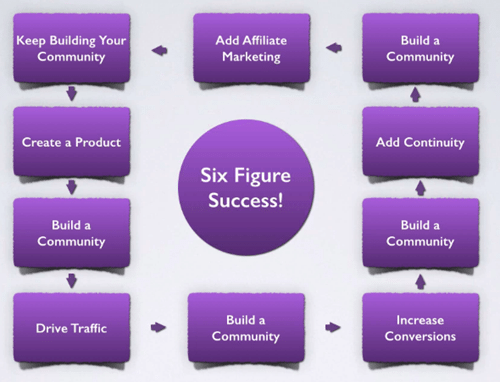 But it should NOT be a core concept of affiliate marketing. I have no issues with writing reviews and getting traffic/sales from that. I can even accept that some people like products that I don't. But what happens most of the time is that sites like Nancy Reviews write low quality information, manipulate their SEO to rank high, and feed people a bunch of false information. The information in training videos was good, no doubt, but there are some things I didn't enjoy about them. First off, Jo has a very forceful voice and is almost shouting throughout all the videos. The training almost sounds like a motivational speech. I guess you can write it off as her being passionate about the subject. OK, fine. This is clearly just a personal preference of mine. You cannot enlarge the video to full screen, and the quality was grainy. I was still able to see everything, but I know there are a lot of older people looking to make money online that would definitely have trouble viewing the vids clearly. And one more thing that's hard to describe, but very important to me was the method of teaching. I felt throughout the videos as if I was being TOLD to do something rather than SHOWN how to do it. For newbies, this is something to pay attention to. When someone TELLS you to go update your DNS, would you know what the heck that means? But if someone opens up their registrar account and actually SHOWS you how to do it, it's going to be a lot easier for you to follow along. Within the training sessions we are told to create a membership site, told to install WordPress, told to start a list and create a funnel, but were now shown exactly how it was done. I think that anyone using this course would absolutely have to go search in Google for supplemental training to explain some of the stuff that was being discussed. It's 3 days since I emailed their support the question about the recurring payment. I also tweeted Jo a day ago when I was having issues setting up my account. So far, no response from either. And while the Facebook community is great, all questions being directed to ONE scrolling page doesn't seem to be very effective to me. For example, after I posted my question, within 10 minutes, an older post jumped to the top because someone commented on it. There also seemed to be more than just support going on; some lady was offering ebooks, and someone wanted testers for a plugin. One place to ask all questions, make all comments, share all news, and whatever else happens is going to be confusing if the community ever grows beyond it's current 600 members. Wouldn't it make more sense to be able to as questions based on what training you were doing? 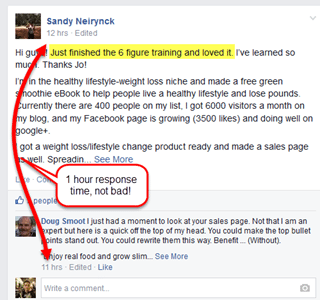 If Jo is teaching us how to create a membership site and earn money from it, why is she using a free Facebook group to organize hers? It would make whole lot more sense to have an online marketing community website. Jo has a good thing going, but there is a lot of room for improvement. Though you are provided with a lot of value for the price you pay, you could be getting more. Where did I get the crazy idea that there's something better than what Jo Barns is offering inside The Online Marketing Academy? Because I'm part of a much better community. All of this comes with a 7 day free trial, costs $47 per month after that. They also offer discounts for annual memberships ($29/month). See why Wealthy Affiliate is rated #1 for online business training and support. Ok, one thing I have to mention is that the what each community teaches is slightly different. The Online Marketing Academy teaches how to create your own info product, membership community, and sales funnel including email marketing. Wealthy Affiliate teaches affiliate marketing with a focus on keyword research, blogging, and SEO. There's also a bit of PPC, local search marketing, and email marketing. If you are specifically looking for product creation and membership site training, go with OMA. If you are looking for general “make money online” information, there's no better place that WA. Now you know that Jo Barnes’ monthly cost of $47, is only for 12 months, and then it’s free, how would you rate her product, with that information to hand? Presumably the other one you like (at $29, for a yearly membership), all has to be paid up-front, which some people may not be able to afford? Also, what does Jo’s system DO, compared to the other two systems you’ve recommended (you say that one helps you develop a product, and the other concentrates on affiliate marketing). I do say in the review, with a screenshot from Joan, that the cost of the membership is only for 12 months and then free. Last time I checked it was $49, but it may have been changed to $47. I’m not sure. Also, I didn’t recommend two other systems – I recommended one. But you are right that Wealthy Affiliate focuses on affiliate marketing, and though I haven’t been inside the online marketing academy for some time, I’ll take your word that it’s more about creating your own products. Hi Nathaniell – great honest review. I bet I know what training either yourself, Kyle or Carson will do next that will make WA complete for now…..
WA is always expanding and adding training, so I’m sure that they will have more to offer in the future. Personally, I’d like to see more email marketing training! I think membership sites are hard to run and not as easy to monetize, but I’ve never run one, so can’t say for sure. Hi Nathaniell, thanks for pointing out that there are two main ways to do your marketing, maybe doing both would be good. I’m not sure I’d say two “main” ways, because there are lots of ways to do online marketing, but there is definitely a difference in what WA teaches and what the Online Marketing Academy teaches. Honestly, the affiliate marketing training here was pretty poor. In the same breath, WA has only a tiny bit of training on product creation, and pretty much nothing on membership site creation.